Not to make you panic...but do you realize that Thanksgiving is two weeks from Thursday? Holy cow. Normally, I'm a bit high maintenance around Thanksgiving. I've only hosted Thanksgiving dinner twice. Like all women across America, I aspire to create the perfect meal amidst the ambiance inspired by the pre-jailed Martha Stewart. Like ninety percent of American women, I will stay up until the wee hours of November 25, trying to create the perfect fallacy of casually elegant dining. The pressure of this meal—the most significant meal of the year—is suffocating for those of us who are not innately domestically talented. I accept that I will be tired. I accept that the kitchen will resemble a war zone. I even will try my best to let the kids “help,” although we all know how much less stressful it is if they would just go play Wii. My turkey flew the coop. Last year, in our family's effort to eat more local foods, I bought a beautiful, organically raised, free-range, had-a-happy-life turkey. I fretted over that bird. I pampered it, brined it, roasted it...and it was heavenly. There was no going back to Butterball. So, this year I again ordered the bird from a lovely family farm where we purchased our turkey last year. They kindly called me when the turkey returned from the processor to let me know I could pick it up. Halloween parties. (Who is crazy enough to be room mom for both kids' classes? Take a guess.) Work, sickness, too much life...I didn't get to the store to pick up the turkey, so I sent an e-mail to ask the store to hold it a bit longer for me. And I found out the turkey flew the coop. Unfortunately, as we all know—especially those of us with kids--things happen. My friend at the store was so apologetic—her daughter accidentally sold my bird to someone else. However, proactive friend that she is, she found another organic turkey supplier who thought he would have a turkey for me...and she'd let me know as soon as it was processed. Would it be 20+ pounds? Would it be as lovely as the one from my friend's store? Would it arrive frozen? Did it truly live a happy-turkey life??? 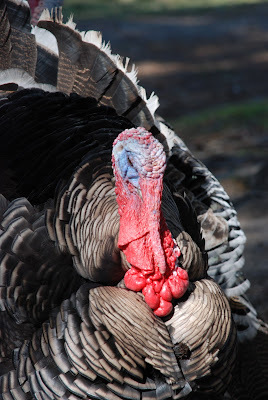 So, as is my unfortunate nature of overreacting, I began scouring websites for a back-up local turkey. After all, we had just visited a lovely farm that raised heritage breed turkeys. I just wouldn't tell Kristen we'd be eating one of her friends. Or we'd order from another local supplier. I knew a farm where a friend got her turkey last year. I'd just do a quick web-search of local turkey farmers, just in case something didn't work out with my friend's supplier. Now, the civic-minded locavore in me is delighted to see the interest in and support of local turkey farmers. The Thanksgiving host in me is praying that my runner-up turkey isn't second-rate. Truly, it's just a dinner. Right? In fact, did you know there's no evidence that the Pilgrims ate turkey at the first Thanksgiving? For that memorable meal in November of 1621, Governor William Bradford sent four men on a “fowling” mission. We know venison, lobster, seal, swans, and corn were served...but what “fowl” made an appearance at the three-day feast is lost to history. Maybe we'll have Thanksgiving lobster this year. Oh, wait. That's not local. Did you also know that no pies, cakes, or desserts were served at the first Thanksgiving? By the time of the harvest celebration, the Pilgrims had exhausted their supply of sugar...plus they didn't have ovens. Where did this pumpkin pie tradition come from, anyway? In fact, it wasn't until 1789 that the government issued the first Thanksgiving proclamation. George Washington called upon Americans to express their gratitude for the “happy conclusion” of the country's war for independence and the ratification of the U.S. Constitution. And did you know Mary's Lamb also played a roll in Thanksgiving? No, thankfully—it wasn't on the menu. However, magazine editor and writer Sarah Josepha Hale launched a 36-year campaign for Thanksgiving to be recognized as a national holiday. She wrote letters to politicians, editorials in publications...and she also wrote “Mary Had a Little Lamb,” which has nothing to do with Thanksgiving. Finally, in 1863 during the height of the Civil War, Abraham Lincoln issued a proclamation entreating all Americans to ask God to “commend to his tender care all those who have become widows, orphans, mourners or sufferers in the lamentable civil strife” and to “heal the wounds of the nation.” He scheduled Thanksgiving for the final Thursday in November, and it was celebrated on that day every year until 1939. Franklin D. Roosevelt moved the holiday up a week to encourage retail sales during the Great Depression. Roosevelt’s plan, known as “Franksgiving,” was passionately opposed. In 1941, Roosevelt signed a bill making Thanksgiving the fourth Thursday in November. History lesson is over. I promise. When did this turkey obsession take over the holiday? Was it Benjamin Franklin's promotion of the turkey as our national symbol, beaten by the Bald Eagle, that led to the predominance of turkey at Thanksgiving meals? According to the National Turkey Federation, 95 percent of Americans eat turkey for Thanksgiving. Why not venison? Seal? Swan? All I know is...I'm going to have a sad family if turkey isn't on the table. So, since I'm guessing you, too, will be featuring turkey at your Thanksgiving dinner, I thought I'd share a brining recipe with you. If you were lucky enough to find a free-range, happy, organic turkey that isn't pumped full of chemicals, brining makes the turkey incredibly tender and moist. It's very simple and worth the effort. In a large stock pot, combine all ingredients except for the ice water. Bring to a boil over medium high heat, stirring often to ensure all salt is dissolved. Remove from heat, and let cool to room temperature. If your pot is not large enough to hold the turkey, pour the broth mixture into a clean five gallon bucket. Stir in the ice water. Remove the turkey and drain excess brine. Pay dry. Discard brine. Cook the turkey as desired. Brined turkeys cook 20 to 30 minutes faster, so watch the temperature gauge. Also—free range turkeys tend to cook more quickly than factory farmed birds. Keep an eye on your turkey! What are you serving for Thanksgiving dinner? Seal? Lobster? I'd love to know...just in case my turkey doesn't come home to roost. Happy holiday craziness, everyone! Breathe deep, and enjoy!